Two pieces to mention from the New Realm series. These are 5″ x 5″ paintings from the aptly titled, New Realm 5 x 5 series. 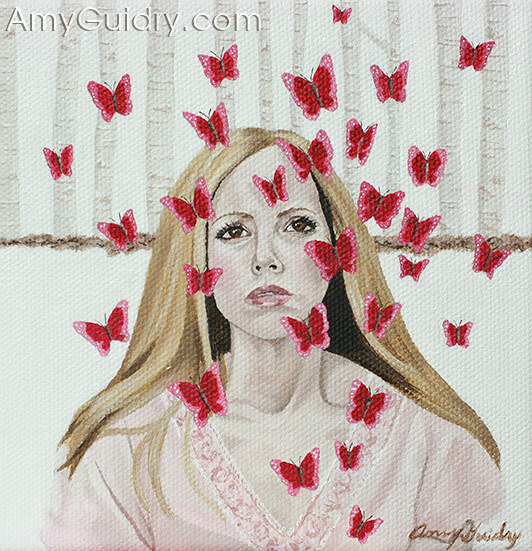 Both paintings feature the heroine of the story as well as the butterflies. The top piece is titled “Daybreak.” This was fairly time-consuming given all the butterflies in the painting. However, I was rather happy with the outcome, so well worth the challenge. The bottom piece is titled “Morning.” This is also part of the 5 x 5 series. This painting stems from the large New Realm piece, “Renewal.” Both have the same concept behind them- that of change, a new day, a fresh start. Both of these new paintings will be featured in my upcoming solo exhibition at the Schepis Museum in Columbia, LA next month. The entire New Realm series, including the 5 x 5 series will be on exhibit. 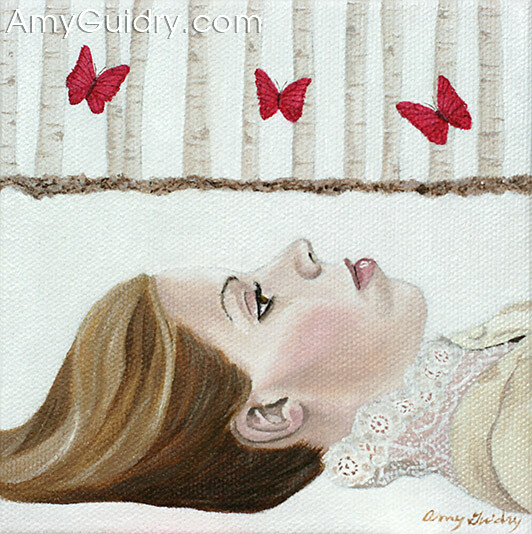 If you would like to view more of my New Realm series, in addition to previous bodies of work, visit my website at www.AmyGuidry.com.